Cover of the first manga volume featuring main characters Aoi (right) and Hinata (left). Encouragement of Climb (ヤマノススメ, Yama no Susume, lit. "Recommendation of Mountaineering") is a slice-of-life manga series written and illustrated by Shiro, which began serialization in Earth Star Entertainment's Comic Earth Star magazine in 2011. An anime television series by 8-Bit aired in Japan between January and March 2013 and was simulcasted by Crunchyroll. A second season aired from July to December 2014. An original video animation was released in October 2017, and a third season aired from July to September 2018. Aoi Yukimura is a quiet girl who prefers staying indoors and is afraid of heights. When she reunites with her childhood friend Hinata Kuraue, who is outgoing and loves mountaineering, they decide to climb a mountain together, in order to see a sunrise they saw together when they were younger. Along the way, they meet several other girls who are also interested in the outdoors, and begin a series of adventures on various mountains across Japan. A high school girl who became afraid of heights after falling off a playground structure and breaking her leg. Thanks to Hinata's influence, she begins to take an interest in mountain climbing. A hyperactive girl who loves mountains. She was friends with Aoi in elementary school before reuniting with her in high school. She encourages Aoi to conquer her fear of heights and take up mountain climbing. A senior student in Aoi's high school who loves mountain climbing. She befriended Aoi when they met in an equipment store. A middle school student Aoi and Hinata met and befriended on a mountain trail. A young photographer who Aoi meets while climbing Mount Tanigawa. Kaede's classmate during both middle school and high school. She often worries about Kaede's safety whenever she goes climbing. Hinata's father, an experienced mountain climber who took Aoi and Hinata to climb Mount Tanigawa when they were younger. An energetic college student who works part time at a cake shop alongside Aoi. The president of the Mountaineering Club in Aoi's high school. Yama no Susume began as a manga series written and illustrated by Shiro and published in Earth Star Entertainment's Comic Earth Star magazine. The first chapter appeared in the September 2011 issue of the magazine, released on August 12, 2011. The series' chapters have been compiled in 15 volumes, published between June 12, 2012, and March 12, 2018. An anime television series, directed by Yusuke Yamamoto and produced by 8-Bit, aired in Japan on Tokyo MX between January 3 and March 21, 2013, and was simulcasted by Crunchyroll. The opening theme is "Staccato Days" (スタッカート・デイズ, Sutakkāto Deizu) by Yuka Iguchi and Kana Asumi. The series consisted of twelve five-minute episodes, with an additional OVA episode bundled with the Blu-ray Disc release of the series on May 14, 2013. A second season, consisting of 24 fifteen-minute episodes, began airing from July 9, 2014. The opening theme is "Natsuiro Present" (夏色プレゼント, Natsuiro Purezento, Summer-colored Present) by Iguchi, Asumi, Yōko Hikasa and Yui Ogura, "Mainichi Koharu Biyori" (毎日コハルビヨリ) by Iguchi, Asumi for episode sixteen onwards; whilst the ending themes are "Tinkling Smile" by Ogura for the first twelve episodes, "Staccato Days" for episodes thirteen to fifteen, and "Cocoiro Rainbow" by Kyoko Narumi for episode sixteen onwards. An original video animation, titled Yama no Susume: Omoide no Present, was released on January 26, 2018, following a screening in theaters and a limited release on October 28, 2017. A third anime season premiered on July 2, 2018 and ran for 13 episodes, concluding on September 24, 2018. ^ 月刊コミックアーススター 2011年 09月号 [雑誌] (in Japanese). Amazon.co.jp. Retrieved December 4, 2013. ^ ヤマノススメ(1) (アース・スターコミックス) (in Japanese). Amazon.co.jp. Retrieved December 4, 2013. ^ ヤマノススメ(15) (アース・スターコミックス) (in Japanese). Amazon.co.jp. Retrieved March 28, 2018. ^ "Crunchyroll to Stream Encouragement of Climb, Mangirl". Anime News Network. December 27, 2012. Retrieved December 4, 2013. ^ "Crunchyroll to Stream "Encouragement of Climb" and "Mangirl" Anime". Crunchyroll. December 27, 2012. Retrieved January 4, 2013. ^ "Encouragement of Climb's Unaired Episode Previewed in Video". Anime News Network. May 10, 2013. Retrieved June 25, 2013. ^ "2nd Yama no Susume Season Slated for Summer". Anime News Network. December 7, 2013. Retrieved March 23, 2014. 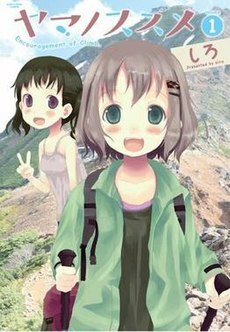 ^ "Yama no Susume Mountain-Climbing Anime Gets 2nd Season". Anime News Network. December 2, 2013. Retrieved December 4, 2013. ^ Green, Scott (July 2, 2014). "VIDEO: Moe Mountaineering Showcased in Second "Encouragement of Climb 2" Preview". Crunchyroll. Retrieved July 6, 2014. ^ "小倉唯　おぐらゆい　RELEASE" (in Japanese). King Records. Archived from the original on October 16, 2014. ^ "『ヤマノススメ おもいでプレゼント』　BD・DVD情報" (in Japanese). Earth Star Entertainment. Retrieved November 17, 2017. ^ "Encouragement of Climb/Yama no Susume Anime Gets 3rd Season in 2018". Anime News Network. June 3, 2017. Retrieved September 24, 2018. This page was last edited on 25 September 2018, at 05:17 (UTC).